trail to enhance the recreational experience for area residents. What they got exceeded expectations. The Crooked Crane Trail isn’t just used by walkers and joggers, it is also used by people who enjoy biking, roller blades, fishing, Frisbee golf, outdoor enthusiasts, dog walkers, and others. This is why Crooked Crane Trail was such a necessity. 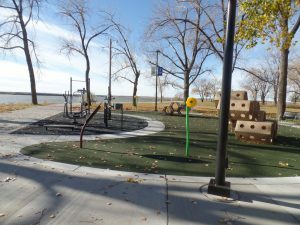 As an added attraction, the City of Dickinson added exercise pods with stationary fitness equipment and playground areas along the trail so all ages can enjoy it. The 1.8 mile double loop trail is the first phase of an 18 mile system that will continue around the northwest and southwest sides of Patterson Lake and connect back east with walking trails in Dickinson. The path was constructed utilizing a slip form paver as well as a concrete pump depending on access conditions. The trail is nearly 10,000 lineal feet long, 10’ wide and 4” in depth. In addition there are nearly 550 lineal feet of 5’ sidewalk to tie the trail in with existing facilities. 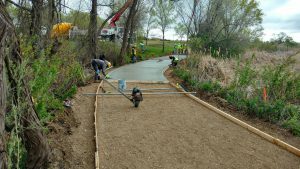 Almost 1,400 cubic yards of 4,000 psi concrete was used to complete this phase of the trail. The trail has two loops along with a land bridge that spans a small creek. The trail also features numerous switch backs to flatten some steep grade areas of the trail to comply with ADA requirements. The design of this project was done in a way that matched the existing topography of the area. The end result of this project is a wonderful, safe, and long-lasting trail that can be enjoyed by all, with beautiful natural views of Patterson Lake and the surrounding areas.